With under two months to go before the release of Injustice: Gods Among Us, we are still getting insight into its roster. With the latest episode of Injustice Battle Arena which pits characters against each other with the fans voting who will come out on top, NetherRealm Studios has revealed two more members of the roster, Sinestro and Hawkgirl, bringing the total up to nineteen DC heroes and villains so far. Sinestro appears in his Sinestro Corps uniform upping the villainous ranks of the roster. Giving a counter to Hal Jordan, Sinestro uses his yellow ring to bring the hurt. 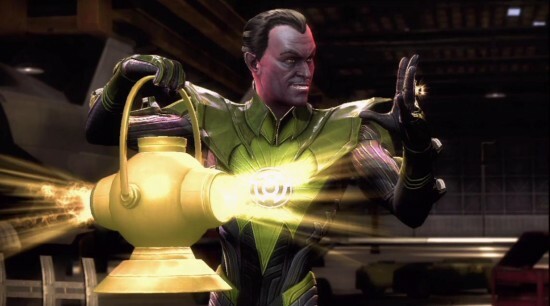 With powers similar to that of the Green Lantern, Sinestro’s ring grants him the ability to create constructs based off his own twisted imagination and ability to instill fear. On the other hand, if you are a Hawkgirl fan, the only spot to come and get her is going to be in Injustice. Having not been explored in DC’s New 52, Hawkgirl will only be around on the gaming screen until she makes her way to the pages of Earth 2. Using her powerful mace and antigravity belt, Hawkgirl will be an agile powerhouse with the ability to fly. Take a peek below at the Injustice Battle Arena video which reveals both Sinestro and Hawkgirl as they take on Superman and Green Arrow respectively. Stay tuned to The Flickcast for more on *Injustice: Gods Among Us* before its April 15th release.